My initial plan was to create something like an “anti-cuddly toy,” a “reversed teddy bear” that would mean the absence of a teddy and at the same time, designate an object which emphasises such absence – such emptiness. However, despite the absence of the teddy bear, it can still be cuddled thanks to the physical existence of its reversed form. 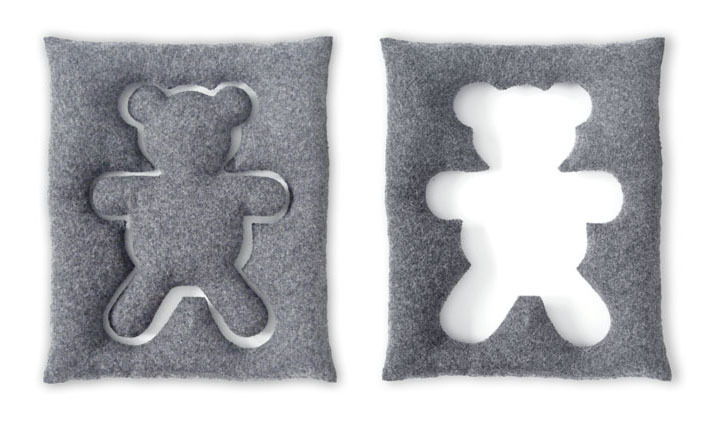 The elements which remained after being cut out served as material for sewing the inside teddy to fill the gap. This was not the initial plan but the complete design looks nice and suggests other interpretations and functions for the item.